30 Degree with 1st class Master of Business Administration, Specialization in Personnel Management or Human Resource or Industrial Relation or Marketing Management or Supply Chain Management. 28 B.Com or BA (Commerce) or Chartered Accountant or Costs and Works Accountants or SAS Accountants of the Indian Audit and Accounts Department with about three years’ experience in Maintaining and auditing of Accounts in Industrial/ Commercial/ Departmental Undertakings. On basis of Online Test/ Interview. 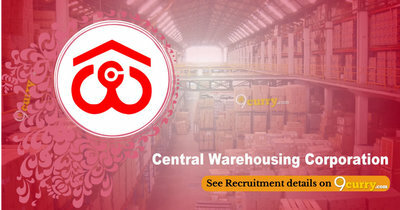 Eligible candidates may apply online at Central Warehousing Corporation's website (direct link is given below) from 15 Feb 2019 to 16 Mar 2019. Candidates log on to http://cewacor.nic.in/index.php?option=com_content&view=article&id=116&Itemid=57〈=en.